Yet, that is not what disturbs me most. You are probably not wondering what it is that disturbs me, but for the two of you out there that are dying to know, let me inform you by way of a story. A few weeks ago, I took my class to a local park and they got some good old-fashioned exercise. Kicking a soccer ball around, working on their gross and fine motor skills, practicing throwing and catching a Frisbee (which is helping them cross midline – super-important!) and enjoying a beautiful southern California afternoon. In short: if your car is a status symbol, park it somewhere worthy of a status symbol – far away from the inferior cars, in a quiet, roomy garage. You know, where the general public can’t damage it playing soccer in a park. PS – how ridiculous is this car? If it is the wave of the future, the future is lumpy and comically sad. 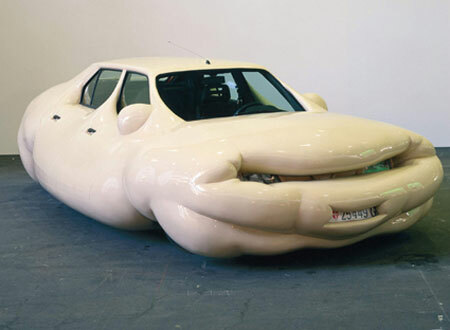 It looks like the Michelin Man’s car. haha! I was thinking the same thing – that car looks like the Michelin Man!!! lol! And I agree with the “unwritten rule” 100%!